The Malawi Union of the Blind has lamented over the delay by government in signing the Marrakesh treaty which most African countries have endorsed. The Marrakesh treaty was adopted worldwide in June, 2013 and its main aim is to facilitate the access of persons who are blind to books and other published works in accessible formats. 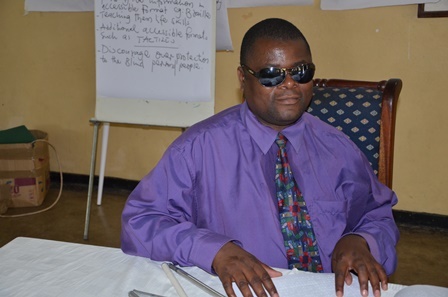 Executive Director for Malawi Union for the Blind, Ezekiel Kumwenda, said it is disappointing that Malawi has not yet signed the Marrakesh Treaty which 27 African countries have signed. “It is very disappointing that Malawi has not signed the Marrakesh treaty and we probably knew that 27 African countries have signed the treaty when we went to the launch of African disability forum in Nairobi Kenya,” said Kumwenda. He further said that there have been delays in signing the treaty. “Government responded to us that the matter is in the hands of the ministry of Justice and constitutional affairs and it is very sad that there had been delays when it comes to signing the treaty,” he said. Kumwenda added that the country is lagging behind in as far as the treaty is concerned.